The coin commemorates the 100th anniversary of the death of William IV of Luxembourg. In the inner circle we see the profiles of the current Grand Duke (Henri) on the left and in the background William IV. Further in the background is a stylized representation of the city Luxembourg. At the top of the coin is the year of issue 2012, preceded by the mint mark and followed by the mark of the mint director. 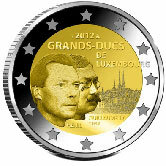 Thereunder is the inscription ”GRAND-DUCS DE LUXEMBOURG” (Grand Dukes of Luxembourg). Finally at the bottom are the names of the two grand dukes next to their profiles with “ƚ1912”indicating the date of death of William IV.